Are your floodplain maps accurate? Flood Insurance Rate Maps (FIRMs) are published and updated by the Federal Emergency Management Agency (FEMA) to provide communities with data needed to establish measures for rating flood insurance, regulating floodplain development, and practicing floodplain management. FIRMs help improve the quality of life, protect the environment, improve the safety within your community, and save residents and businesses money. Have I ever been curious whether our existing Flood Insurance Rate Maps are accurate? Does my City or Town have residents or businesses that pay flood insurance but have never had flood damage? Are there properties that have been impacted by flood waters but are not shown in a mapped flood zone? If you answered yes to any of these questions, the current flood insurance rate maps published by FEMA for your community may be inaccurate or out of date, requiring revision. The National Flood Insurance Act of 1968 directed the Federal Insurance Administration (FIA) to identify all floodprone areas within the U.S. and establish flood-risk zones within the floodprone areas. Flood data and floodplain information from many sources were used to overlay the approximate outline of the base (100-year) floodplain for various stream reaches on available community maps. As more federal money became available, more detailed studies were performed for many communities, resulting in the publication of FIRMs. Approximate study methods were used to develop the flood maps based on limited information, with some community FIRMs containing little new information. If not already completed, you will need to perform a detailed study of local floodplains. You can view the most current flood maps per Indiana County on the Indiana Department of Natural Resources (IDNR) website. 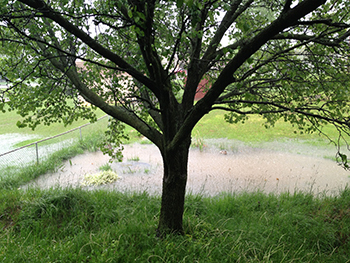 If your community has floodplain areas which have not been studied by FEMA, develop a detailed floodplain analysis to determine the base flood elevations and floodway limits for the water bodies in your community. This will help ensure proper watershed management and floodplain awareness for your local government officials, businesses, and residents. If revisions need to be made to the FIRMs, submit a Letter of Map Revision to IDNR for approval prior to sending to FEMA. Revising your maps can be a lengthy process, taking 1-2 years to complete. However, having accurate flood maps will help reduce your community’s flood losses and protect your local floodplains and the natural resources within them. Topographic Survey – conduct a field survey of the drainage conveyance (river, stream, ditch) to gather accurate elevation data on the portion in question. Hydraulic Modeling – enter the survey information into a hydraulic model and perform hydraulic calculations to determine base flood elevations are consistent with the current flood maps. Submit model and forms to FEMA for review and final approval. Consider updating your community’s FIRMs to provide an accurate representation of which properties in your community are subject to flooding, reduce the risk of new and existing structures from being flooded, and improve community safety! Download this case study to learn about the benefits to the City of Beech Grove from revising their flood rate maps.